There is now something of a religious fervor around the international goal of 2°C, to the extent that it is almost impossible to discuss other trajectories or outcomes. The only contrast that seems possible with 2°C is something that nobody wants, which is the “do nothing” scenario of 4°C or more. The text itself lays out an intention, but translating this into something tangible is easier said than done. It also turns out to be quite a divisive process and requires a deep dive into some reasonably complex statistics. This was perhaps best highlighted by the paper Greenhouse-gas emission targets for limiting global warming to 2°C, Malte Meinshausen, Nicolai Meinshausen, William Hare, Sarah C. B. Raper, Katja Frieler, Reto Knutti, David J. Frame & Myles R. Allen, Nature Vol 458 / 30 April 2009 (a copy is currently available here). Meinshausen et. al. showed that the uncertainty of the climate response combined with a variety of emission pathways delivers given probabilities for staying below 2°C, depending on the cumulative emissions over the period 2000-2049, with some indication of eventual outcome also given by emissions in 2020. This is all very well, but the next step is the tough one. The call at Cancun was to “hold the increase below 2°C”, but this means different things to different people. At the meeting I attended recently, some interpreted this as meaning a “reasonable probability”, which was then interpreted as 75%. 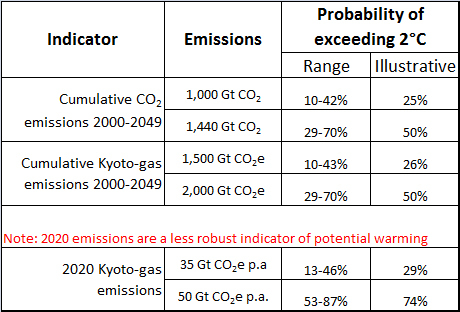 The table above shows that this means a limit on cumulative emissions between 2000-2049 of 1,000 Gt CO2. But with emissions from 2000-2013 already totalling about 470 billion tonnes, that leaves a remaining budget until 2050 of just 530 billion tonnes. That’s about 14 years of full on emissions, or for example, a trajectory that requires an immediate peak in emissions followed by year on year reductions of about 1.2 billion tonnes until emissions are near zero. Delaying the peak until 2020 pushes up the reduction rate to nearly 3 billion tonnes per annum. By contrast, accepting a 50% probability gives a very different outcome. Emissions can peak in 2020 and a reduction pace of 1 billion tonnes per annum is then required. Alternatively, should emissions plateau in 2020 and start reducing in 2025, the annual effort rises to 1.5 billion tonnes. These are still very challenging numbers, but almost a world apart from the 75% probability case. The 75% case is most likely unachievable given where the world is today. What was clear from the meeting I attended was that two people who may both talk about 2°C have very different perspectives on likelihood, usually without any thought as to the reduction implications behind their assumption. The EU is at least clearer on this in its main publication on the 2°C Target, where it notes in the key messages, “In order to have a 50% chance of keeping the global mean temperature rise below 2°C relative to pre-industrial levels . . . . .”. David, analysis is correct, but it would only be relevant if we would now be at a fork in the road where we would have the luxury to chose between a 50% and 75% chance for 2 degrees. However, we are not anywhere close to that fork in the road yet. Instead we have to now start acting as though we would like to have any chance at all of staying below 2. If we continue on our current path we will have a 0% chance of staying below 2 degrees. So all of our effort should go into changing course immediately, using all tools available to us; efficiency, renewables and ccs. Any delay just raises the total cost. Agree, but we could start to have a meaningful discussion about where we can get to, rather than simply getting hysterical about 4 deg.C which is what many are doing. What percentage reduction from 2012 emissions levels, over what time frame, corresponds to permanently preventing exceedance of 2C? To guarantee not exceeding 2 deg.C then it’s probably too late, since the current range of uncertainty with regards long term warming, even if all emissions stopped now, includes some chance of >2 deg.C. For the 75% case based on current views on climate sensitivity, you have to peak now and start reducing by about 1.2 billion tonnes per annum such that total cumulative emissions since 1750 don’t exceed about 800 billion tonnes carbon. Given where we are today that’s unlikely to happen. Frankly, I think the discussion has become somewhat senseless. At the end of the day we are going to do the best we can and that effort will be adjusted over time as people become more or less concerned about the long term prognosis. Then we will just have to see what happens with the climate. Not a great plan, but it’s hard to see the necessary effort being put into this given the current political discourse on the subject. David, with all due respect, I have a serious issue with this: “…we are going to do the best we can and that effort will be adjusted over time as people become more or less concerned about the long term prognosis. Then we will just have to see what happens with the climate. Not a great plan, but it’s hard to see the necessary effort being put into this given the current political discourse on the subject.” Shell could lead the way. The likes of Shell, ExxonMobil and other industry leaders could take the bull by the horns and simply begin to reinvent and begin replacing refineries with renewables. People will know you are right. Good people like you across all energy sectors would follow Shell when you decide and present the case that any probability of casting humanity off the precipice is too great. People will stop quibbling over 50% or 25% — we know that any probability over zero that is targeted intentionally is tantamount to murder. Who would force their child to play Russian Roulette with 2 or 3 loaded chambers? Just decide. To continue on our current path is just wrong. Start implementing a serious business plan that would take Shell from its current mix of hydrocarbons to a mix that is suggested by any reasonable analysis. This one http://bit.ly/LetsGetGoing suggests we get down to burning zero hydrocarbons by mid-century. Besides, you would be acting with fiduciary duty to your shareholders, the markets, the economy, as well as humanity. Begin reinventing Shell today. Be more than just an oil company — be a state of the art energy company. Start now by retiring one refinery. Drive change. Lead, don’t follow. I don’t disagree with your sentiment, but the route to change isn’t going to happen as you describe. Companies like Shell have tried to force the issue through policy change, but success has been hard to come by. We have managed to get some CCS going which we see as far more targeted at the climate issue than investment in renewables, but we have not had across the board success. Just look at the situation here in Europe. It’s the policy landscape that needs to change. Agree the route I describe for implementation is a bit of a pipe dream, but I just don’t see the “business as usual” methods getting the reductions started quickly enough to avoid the red — or perhaps that new Australian color “purple” — on the chart at http://bit.ly/LetsGetGoing … purple would be shifted tot he right of the red curve, peak a bit later and higher, and require a precipitous decline that nobody in his/her right mind would wish upon my sons in their old age, or my grandsons in their middle age. I just don’t see the policy landscape changing any time soon … sufficiently. Lacking any hope that US President or Congress — or any other world government leader or body — can put effective measures into place (including CCS), what alternatives do we have but to get outside the conventional paradigms and shake people up enough to get people like Messrs. Voser, Dudley, Tillerson, Watson, de Margerie, Lance, Kleese, and all their peers to answer the call from one bold member of this elite group … one who has the realization that we have got to get started now, and one sure-fire way is to just start shutting down the 700+ refineries. Not only would that give real reductions in production and concomitant reductions in emissions, it would create a de facto carbon “tax” which you desire in order to incent CCS. Perhaps the government leaders of the world would follow suit in shame or in order to take control in their own bombastic way. Polly Higgins speaks of how Charles Grant (Chairman of the British East India Company and Parliamentarian in the early 1800s) had the realization that half the slaved on earth were owned by his company. He denounced slavery as immoral and began working with his peers to make adjustments to the conventional paradigms of the day, and within a short period of time, Britain abolished slavery. I believe one of these CEOs could be the modern-day Charles Grant. Do you? The bottom line is we need to Replace Refineries with Renewables. By all means! Great thoughts and comments Doug! Dear David, i believe the two people will have more thoughts in common whan you might think, like: I want to make sure my kids grow up on a liveble planet, by 2050 we’ll have to be carbon free, the sooner the better and we know for sure that we can’t burn all proven reserves of oil, gas and coal. So Paul-Polman (CEO Unilever) kind of leadership is higly appreciated! #YesYouCan!.